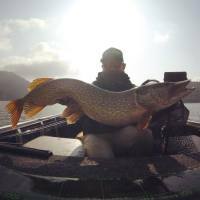 Predator Fishing is a huge sport in Extremadura, there are no less than 5 local lakes, totaling over 60,000 acres, that are teaming with Predators including Pike, Bass and the Comizo Barbel. 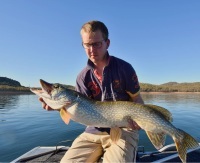 Extremadura Predator Fishing gives you the opportunity to fish these prolific venues with our Guided Boat Fishing or drive yourself at your own leisure with our Self-Drive Boat Fishing package. We have a wide selection of boats available from 15hp right through to 100hp boats. La Serena, Zujar, Orellana, Garcia Sola and Cijara are the main lakes we have on our doorstep, ​that hold a large head of Predatory fish such as Black Bass, Pike and Barbel. Zander are spreading throughout the water system and showing more regularly every year, huge Carp and Comizo Barbel regularly make an appearance to lure anglers as they are very aggressive and carnivorous. There are over 5 strains of Barbel here, including the legendary Comizo Barbel. These agressive predators give us some fantastic fishing on the lure, they grow to over 20kgs and we have banked them to over 37lb on lure. 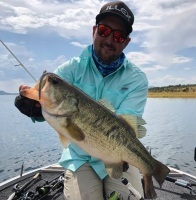 fishing for Bass is huge in America and other countries where they inhabit; No Wonder, it's exciting and full of action, especially on surface lures. Whilst fishing for them, tight up to snags, sunken trees, bushes and the like, the anticipation of a take as soon as your bait hits the water is exciting enough, but the fight they give is something else. They will jump, somersault, dive under the boat and at times even tail walk... its great sport on light tackle and what's more, they are getting on to double figures here !!!!!! have been caught to a staggering 30kg in the local area, we have landed pike to over 35lb. Some lakes are stuffed with them, like Garcia Sola where over 30 hits a day from fish over 80cm is a regular occurance and Orellana, where two guests have taken over 100 Pike in 3 days from Float Tube. go to well over 15kg and give a good account for themselves. Several of our local lakes contain these scavengers and our guests have landed Cats to over 12kg. ​ yes Carp, again a predator fish and these go to over 80lb here and have been regularly caught by Predator anglers. We have landed Carp to over 37lb on lures.